The first thing I notice coming into the house is the wide entryway that leads to an expansive open layout. I pass through the spacious foyer and into the great room that hosts the kitchen, dining and living room areas. 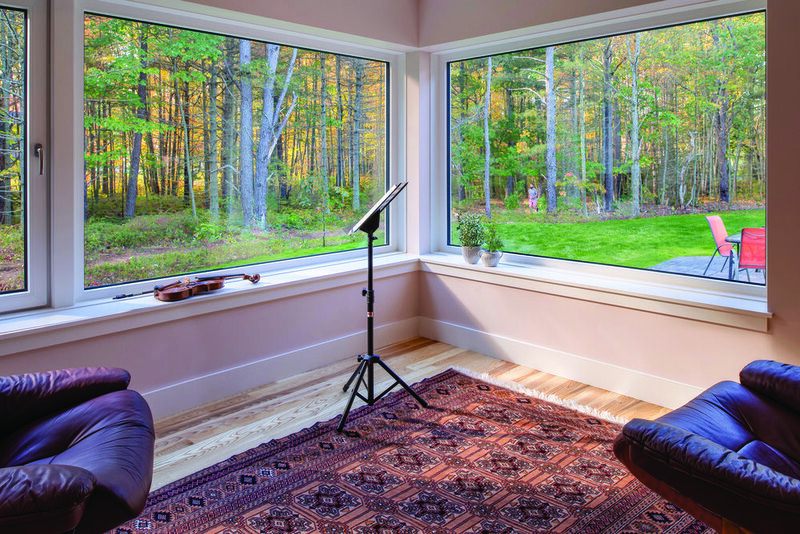 A row of large triple-pane tilt-turn windows along the back side of the house provides an abundance of natural lighting and invites appreciation of the adjacent trail and conservation land. The house flows naturally and expertly, simultaneously maximizing solar access while enabling single story living on this third of an acre lot. An inset sunroom, which connects the dining area with two guest bedrooms, could chase away even the slightest winter blues. I imagine sitting here and watching wildlife from the abutting nature preserve, as the owners often do. An open floor plan joins the kitchen, dining and living room areas. A row of large triple-pane tilt-turn windows along the back side of the house provides an abundance of natural lighting. As we continue the tour, I also notice how quiet the house is — a benefit, no doubt, of its air-tight construction and 13-inch walls. I’m struck by the noticeably fresh air, a clear sign of balanced ventilation, which is a necessity in any home built as tightly as this one. Their initial goals were to achieve high levels of energy efficiency, Passive House standards if it made financial sense, and net-zero annual energy use, if possible. After several energy models showed that meeting Passive House standard would be impossible with the tall pine trees along the south side of the lot, they scaled the plans back to “Pretty Good House” insulation levels and an air tightness score of 1.0 ACH50, many times tighter than most new homes in the state but still shy of the impressive .6 ACH50 Passive House standard. 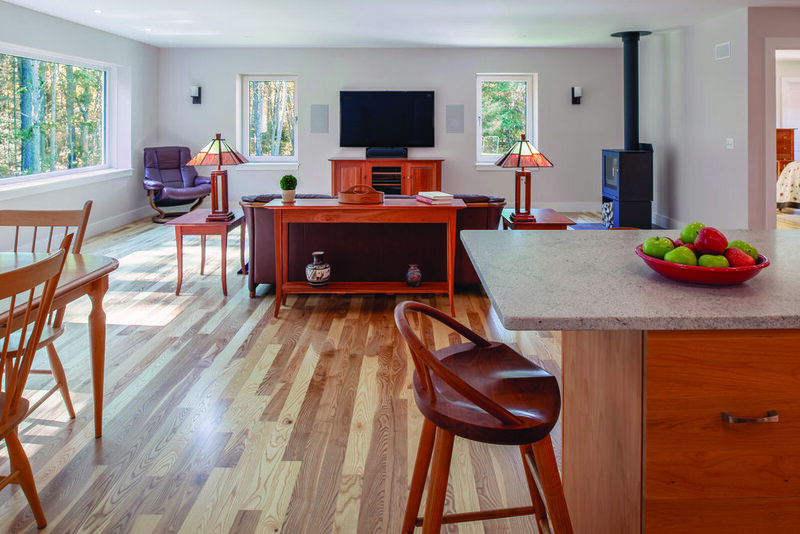 In the end, with a final shell test of .125 ACH50, they surpassed Passive House standards, achieving one of the tightest homes in the state. The Martins purchased a Rais wood stove they use about twice a week. It is so efficient that, when in use, it provides enough heat to warm the 2,200sf house without the use of heat pumps. The Martins credit Reggie and his team for their “high quality construction techniques” and attention to detail. “Reggie and his team were very compulsive,” says Steve. He tells me that he is too, so he appreciates it. The net-zero goal was also exceeded. The energy model shows that the house will likely use 12,000 kwh of electricity each year. A bank of 48 solar panels on the south side of the roof is projected to generate 14,000 kwh annually, producing a 2,000 kWh surplus that will nicely offset the power needed to charge a planned-for electric car. For the Martins’ home, this meant ash flooring from Fat Andy’s Hardwood, Eastern white cedar from Yoder’s Sawmill in Corinna for the entryway and Western hemlock clapboards. The team agreed that for environmental and quality reasons the cladding should be real wood over a rain screen to allow the walls and cladding to dry quickly. While not local to Maine, Western hemlock is domestic, natural and will last a long time. As any builder can attest, harmonizing desires and the budget is an ongoing balancing act. Homeowners, Steve and Cheryl Martin. 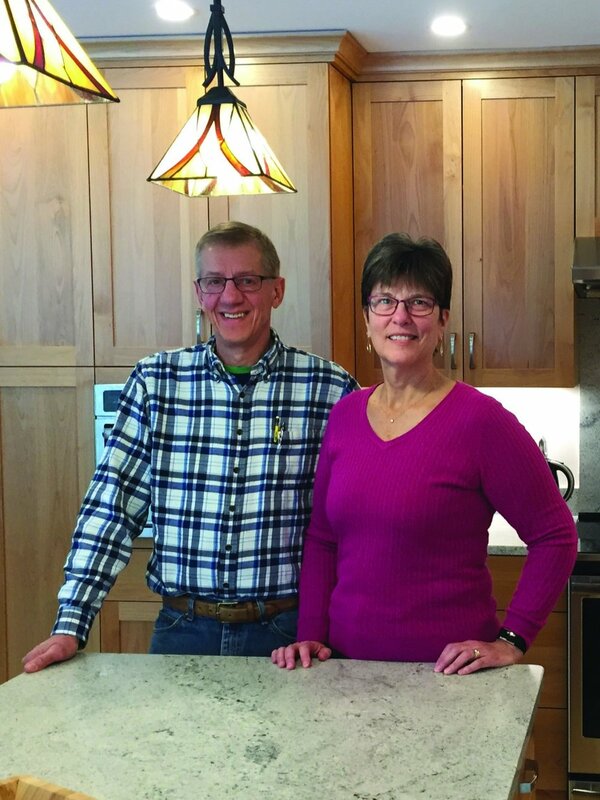 As a point of comparison, they had always considered their home in Presque Isle to be fairly efficient for an old house with four-inch walls – but even so, they paid an average of $3,200/year in energy costs for that home. They expect the total energy use for the Brunswick home to be in the $150-$200/year range, and most of that is made up of the $11/month base rate they pay CMP to stay connected to the grid. 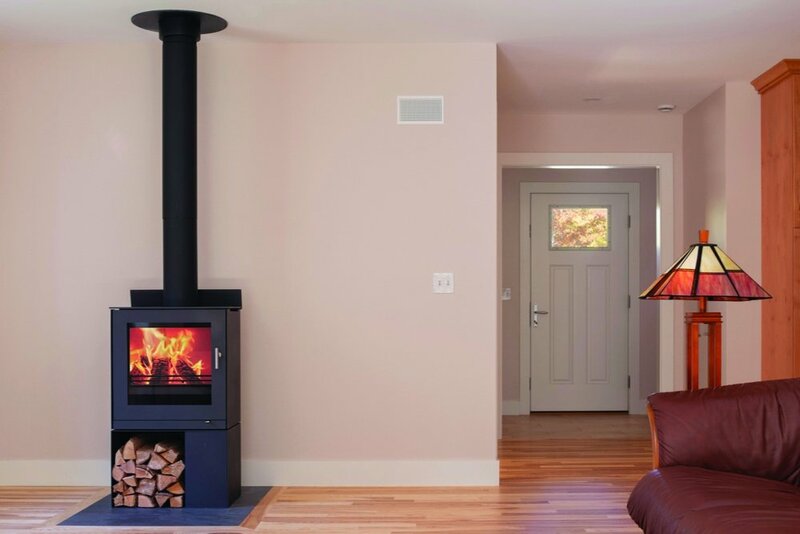 The wood stove helps keep their electricity needs down – they have a Rais wood stove they purchased from Performance Building Supply. They use it twice a week, and when they do, the heat pumps don’t even come on. “It’s unlike any other stove we’ve used. A small pile of wood will burn all day,” says Steve. When I ask how the solar PV system is performing, Steve replies it’s pretty much as expected. “We think we’ll come in at net zero this year.” And that’s even considering all the energy that was used during construction. Installed in April 2018, their system generated enough electricity over the summer months, while the home was still under construction, to bank credits that carried them through March 2019. An inset sun room gazes out to the adjacent trail and invites wildlife watching while providing a cozy place to enjoy morning coffee. This home has some outstanding stats in energy efficiency. The home is net positive with a 14.34 KW solar array on the roof providing slightly more energy than the house needs. The home is also incredibly tight, boasting an air-tightness of 0.125 ACH50! (ACH50 is Air Changes per Hour at 50 pascals of pressure.) By comparison, a Passive House requires a hard-to-achieve air tightness of 0.6 ACH50 and a typical code compliant house has 3.0 ACH50 or more. This was achieved through careful design by Mike Maines and diligent execution by Emerald Builders. The result is a highly insulated, efficient structure celebrated in a lovely, comfortable, sensible and elegant home. BUILDING ENVELOPE: Foundation—4” of Thermax foam insulation (R-26); 12” dense packed cellulose on rim cavity (R-42), 4” of EPS foam sub slab (R-16); Roof—loose blown cellulose over Pro Clima Intello™ smart barrier at the ceiling, (R-65); Windows—Logic™ tilt-turn triple-glazed windows from Pinnacle Window Solutions. SYSTEMS: Three Mitsubishi mini split heat pumps with wall cassettes provide heating and cooling; Zehnder ERV for ventilation’ State heat pump hot water heater; Rais wood stove from Performance Building Supply. RENEWABLES: 14.34 KW PV solar system by Revision Energy. Net Positive by design. LOCAL MATERIALS: ash flooring from Fat Andy’s Hardwood, Eastern white cedar from Yoder’s Sawmill in Corinna for the entryway, landscaping pavers from Genest Concrete. 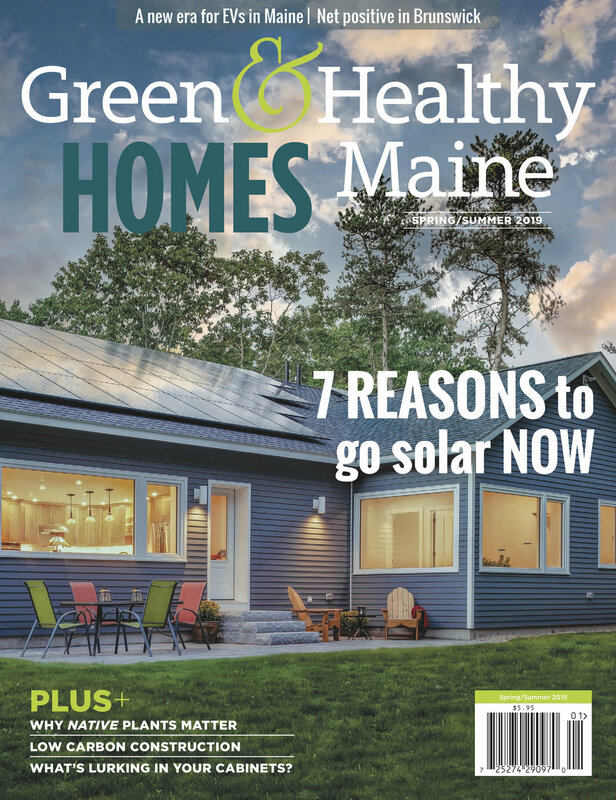 This article first appeared in the spring & summer 2019 issue of Green & Healthy Maine Homes magazine.